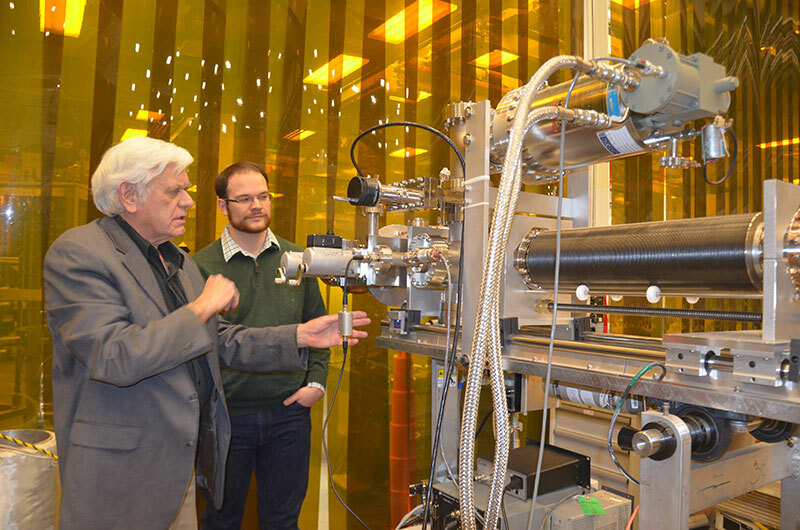 During a visit to Jefferson Lab in 2015, William and Mary graduate student Matthew Burton learns from his Jefferson Lab Advisor, Larry Phillips, about the lab equipment he would use during his DOE-funded research project. The Department of Energy recently announced that its Office of Science Graduate Student Research (SCGSR) program is accepting applications for the 2018 Solicitation 1 cycle. Applications are due by 5 p.m. Eastern Time on Tuesday, May 15, 2018. The SCGSR program supports supplemental awards to outstanding U.S. graduate students to conduct part of their graduate thesis research at a DOE national laboratory or facility in collaboration with a DOE laboratory scientist for a period of three to 12 consecutive months—with the goal of preparing graduate students for scientific and technical careers critically important to the DOE Office of Science mission. Over the last few years five graduate students received this DOE funding to support their projects, which were based on Jefferson Lab’s mission and unique technological capabilities. In 2017 Joseph Karpie, a Ph.D. student in William & Mary’s physics department, was named a program recipient. Karpie studies theoretical and computational aspects of quantum chromodynamics (QCD) at Jefferson Lab. His advisor, Konstantinos Orginos, is jointly an associate professor of physics at William & Mary and a senior member of Jefferson Lab’s Theory Center. Tyler T. Kutz, with Stony Brook University, is working on an experimental nuclear physics project at Jefferson Lab with Robert Michaels, a Jefferson Lab staff scientist. In 2015, Jason Bane, University of Tennessee; Matthew C. Burton, William and Mary; and Luke A. Robison, Northwestern University, were recipients of funding for their respective graduate student research projects carried out at Jefferson Lab. The SCGSR program is open to current Ph.D. students in qualified graduate programs at accredited U.S. academic institutions, who are conducting their graduate thesis research in targeted areas of importance to the DOE Office of Science. The research opportunity is expected to advance the graduate students’ overall doctoral thesis/dissertation while providing access to the expertise, resources, and capabilities available at the host DOE laboratories. The supplemental award provides for additional, incremental costs for living and travel expenses directly associated with conducting the SCGSR research project at the DOE host laboratory during the award period. The Office of Science expects to make approximately 50 awards in the 2018 Solicitation 1 cycle, for project periods beginning anytime between October 29, 2018 and March 4, 2019. Since its inception in 2014, the SCGSR program has provided support to more than 300 graduate awardees from more than 100 different universities to conduct thesis research at 17 DOE national laboratories. Questions may be directed to SCGSR Program Manager, Dr. Ping Ge, at: sc.scgsr@science.doe.gov.